You know how I show you guys what I found when I get back from the thrift stores and yard sales? Well, the younger peeps call that a “thrift haul” and I guess on YouTube it’s all the rage to post what you bought. Yeah, it’s a thing! Who knew I was all cutting edge? Well, here’s my latest thrift haul, although none was actually found in a thrift store this week. So let’s start off with the elephant in the room. The big green elephant with cool graphics! If you follow me on Pinterest or Facebook, you know I saw this at the antique mall on Friday and thought it was cool looking. But the sanitary factor of buying a used first aid kit was giving me the heebee jeebees. After staring longingly at the photos on Saturday and at the urging of some Facebook followers, I decided to high tail it back to the store and buy it. I’m glad I did. I have not opened it yet though. You can tell by shaking it that there’s “stuff” in there. But I’m just afraid that it’s used band-aids, a severed finger or maybe even something weird, so I will wait a few days until I get up the nerve to explore it. I grabbed this tiny little ball pitcher when I went to rescue the first aid kit on Saturday. Because it’s orange. And it’s October. For the 31 days of October I am addicted to anything orange. After that, not so much. I have no idea why it’s so small. I guess it could be a creamer? On a lark, I bought this camera a few weeks ago. It is a Lark from Irwin Corp and I believe it’s from the 40’s. 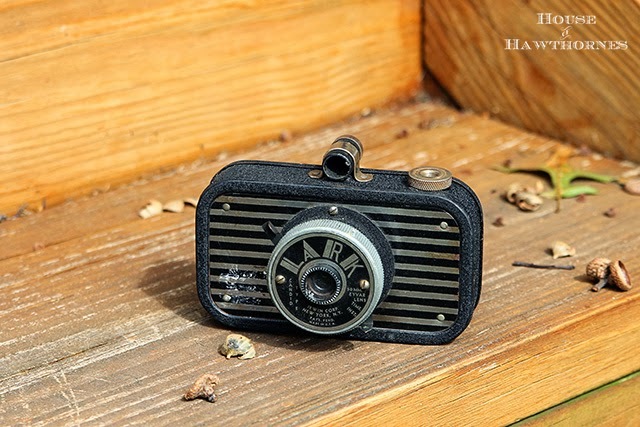 When I was looking online for more information about this little camera, I ran across a few people calling it a sardine can camera. Spot on description! Last but not least, is Tom the turkey planter. I found two of these at a yard sale that was 99.9% tools and then the two turkeys. They were not marked and when I asked the guy how much they were, he asked if I would pay a buck. For two of them. Uh, yeah!!! I sent one of them to roost at my niece’s house and kept the other one here. Besides my orange addiction in October, I have a little turkey addiction in November. I might as well start feeding that turkey addiction a little early. Other than that, the only news around here is that I feel like poop. I woke up Sunday to a sore throat that’s not going away with orange juice, so I think I may just put my jammies back on and crawl back into bed until my son gets off the school bus. What did you score while out thrifting and yard saling this weekend? Pam I love your ‘thrift haul’ for sure. I am so attracted to orange in Oct also, other months, not so much!! You had some wonderful finds, Pam! Altered artists love the old rolls of tape and gauze in those first aid kits…they usually have nice age to them. Hope you feel better SOON!! Come on! I dare you! Open up that first aid kit!! 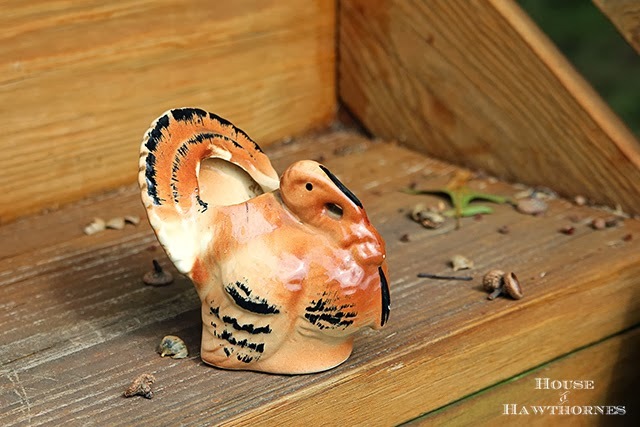 I have a thing for turkey planters too. Cool camera. I can see where the sardine description fits nicely. Rest up, lady! I would have bought that First Aid Kit in a second! You need to open it! If it’s filled with hundred dollar bills, then you will have more money to fund your orange/turkey addiction. That would be orange or turkey, not orange turkey. That would just be weird. 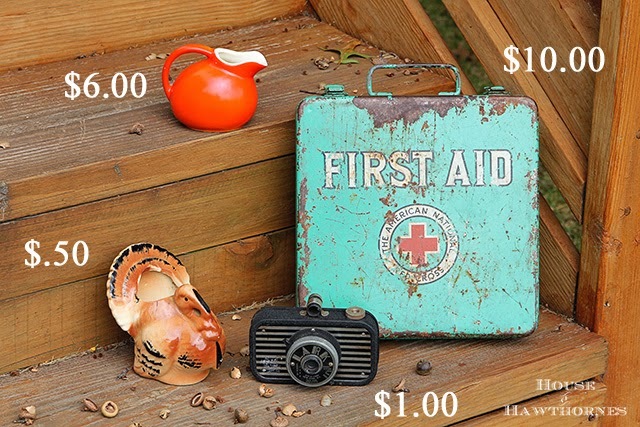 Those are great finds…love the first aid kit! Open it, open it, open it! Then tell us what’s in there. LOVING all your finds. Especially the little orange pitcher. Turkey too. You need to get into that first aid kit. I bet you find a Mercurochrome bottle with a glass applicator and a dried out red rubber stopper. Some old gauze. Possibly some old band aids, though it may predate band aids. I’d be looking in that in a New York minute. Now I may do more time wasting on youtube. You should not have shared that tidbit with us. Great finds. I especially like the camera. 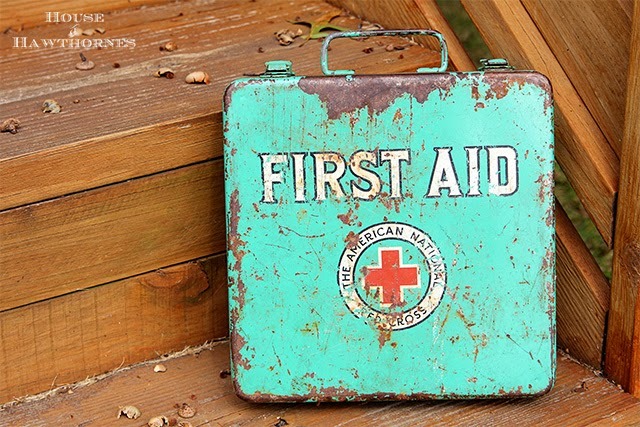 Love your finds and the color of that 1st aid kit! I had no idea that people share their thrifty stuff on YouTube! I must look! The first aid case is so darn cool! It’s perfectly colored and aged! You seriously scored with that. Just open it!!! Cool stuff, Pam. I always have a little of the “ick” factor on stuff until I can clean it thoroughly. The first aid kit is very cool. Ooh, I love the fun color and graphics on that first aid kit. You definitely scored. What a cute camera. 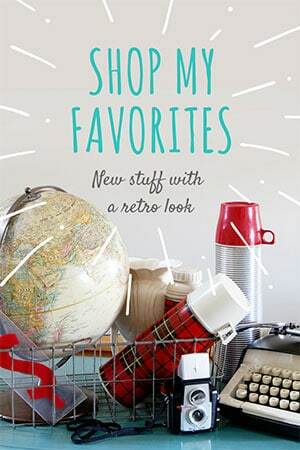 You always have great finds, and these are no exception–fun goodies and great prices! I have the same poop you do –worst sore throat I’ve ever had…I hope your jammie day helped. Open it 🙂 Love the first aid kit…it’s the perfect color. I have the same “orange in October” collection. Fun finds!! I’m so glad you went back for the first aid kit!! You could decorate a room around that lovely color….or a whole house!! And I’ve got an “Orange Crush” on your little creamer. So cute! Oh, so sorry to hear that you are feeling poorly! Hope you get better soon. Love your thrift haul…. all good stuff, including the first aid kit. Best find of all, in my opinion… that little orange pitcher. Darling! No thrift finds here. Too cold for yard sales, and there isn’t a decent thrift store around for 60 miles. One of these weekends, I’ll take a trip to my favorite thrift store. Great finds, Pam!!! 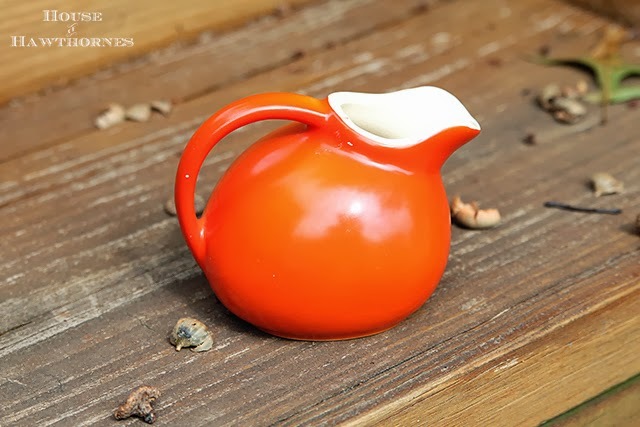 I’m in love with all things orange now, too, AND I have one of those little creamers. I think it’s Shawnee, but not totally sure. Put on some rubber gloves and open that first aid kit….we all want to know what’s in it!!! p.s. 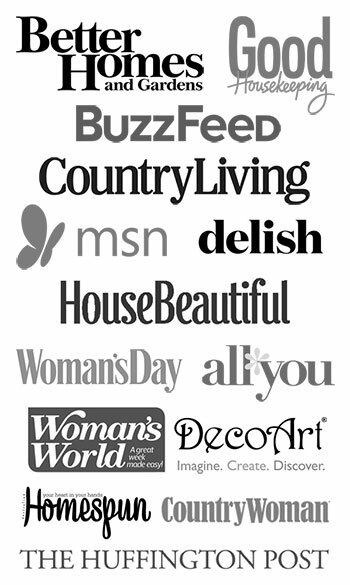 I am going thrifting with Donna from Distressed Donna Down Home Blog on Thursday. Can’t wait. Fall Garage Sales starting tomorrow. We’ll see.